Abas Ermenji (1913-2003) was a political figure and resistance fighter of the Second World War period. 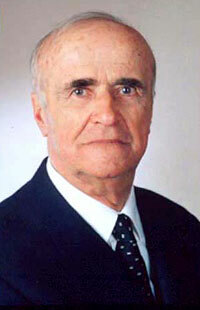 He was born in Skrapar and educated in Berat, Shkodra and Paris, where he studied history at the Sorbonne in 1934-1938. 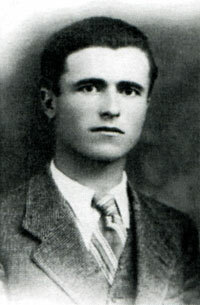 He returned to Albania in 1938 and taught secondary school in Korça. In November 1939, he was arrested by the Italians in Greece when he was attempting to gather a fighting force of Albanian exiles, and was held in captivity on the island of Ventotene until 1941. On his second return to Albania he became a leading figure of the Balli Kombëtar resistance movement and helped liberate Berat of Italian influence. He was extremely anticommunist. When the communist partisans took power in Albania, he fled to Greece (1946-1947) and then to Paris where in August 1954 he and Vasil Andoni founded the anticommunist National Democratic Committee for a Free Albania (Shqypnija e lire), that included numerous Balli Kombëtar figures in exile. Ermenji returned to Albania in 1991 when Balli Kombëtar was restored and led the party throughout the 1990s, though it never regained much popularity. In the period 1949-1951, at the height of the Cold War, Abas Ermenji was involved in half-hearted Anglo-American endeavours to overthrow the communist regime in Albania. He describes his involvement in the failed operation in the following two interviews given to Lord Nicholas Bethell (1938-2007), author of the book “The Great Betrayal: The Untold Story of Kim Philby's Biggest Coup” (London 1984). During the war I fought with Balli Kombëtar in south and central Albania. When the communists took over, I went underground with a small group of bodyguards and crossed into Greece at the end of 1945. First I was imprisoned by the Greeks in Salonika and I believe that they might have eliminated me, because they knew of my firm stance on the question of Albania’s southern frontiers. In April 1946 I was moved to Piraeus and kept as a prisoner of war. Later I was allowed to live in a small flat in Piraeus and other Albanians helped me to live. It was there that I was approached by Julian Amery and others in early 1949 and asked to help form the Albanian National Committee. Amery and McLean said that there was a danger that Yugoslavia and Greece might make an agreement and march into Albania, since Tito was no longer Stalin’s ally and Albania was geographically isolated from the Soviet bloc. The Greeks did not want to allow me to leave the country and the British had to intercede with the prime minister to get permission for me to leave. The prime minister agreed, but secretly, so as not to lose credit with the supporters of “northern Epirus”. I told Amery and Mclean that I accepted their proposal, but I wanted to consult Midhat Frashëri who was in Istanbul at that time. Frashëri was president of Balli Kombëtar and would have to take the final decision. I was issued with a passport in a false name and let through the control at Athens airport. My problem in Rome was that I was living with false documents and members of the “Independenza” could have had me arrested. There were many of them in Rome and they had great influence with the Italians. They had helped the Italian fascists during the war. Their leaders were Ernest Koliqi and Ismail Vërlaci. The Americans spoke to Midhat Frashëri in Istanbul and persuaded him to allow royalists into the committee. The American plan was to have Frashëri as the committee’s president and Abas Kupi as commander of the armed forces. We thought that it was bizarre to have a president who was not also commander-in-chief. Personally I thought Abas Kupi a capable commander, but far too restricted by his royalist convictions. During the war he was always very careful. He did not expose himself. I liked him, I tell you frankly. He was very amiable and wanted to be good friends. He obeyed the orders of Toptani. Frashëri and I had angry talks with the Americans about who was to be commander-in-chief. Several times we had to get up and leave the room. In the end we came up with the idea of a junta consisting of Abas Kupi, Said Kryeziu and myself. It was only after this agreement that the Italians agreed to regularise my position and issue me with a refugee passport. My guess is that half of the fighters trained by the British and infiltrated into Albania returned safely, whereas almost all the American-trained fighters were killed or captured. There were no leaks on the Albanian side but the operation was given away by Philby. My main complaint is that we were deceived by the British and Americans. They promised to provide us with the means to liberate our country. In actual fact, they only trained a handful of people. And they promised to gain the cooperation of Greece and Yugoslavia. I found most of our people in camps near Naples, others from Greece. They knew that I understood the situation in the country. They trusted me and they volunteered to fight because I persuaded them. Almost all of them accepted. They wanted to liberate their country and their families. I went to Malta for a month in July/August, firstly to give them instructions, as to what to do and whom to contact, secondly because they would never have gone if I hadn’t asked them to. However, I believed then and I believe now that no communist country could ever be overthrown by methods of small-scale subversion. In fact, the British and Americans were treating Albania like a guinea-pig. If it had succeeded, they would have tried another country and another people. As for the suggestion that the operation helped to crush the communist rebellion in Greece, all I can say is that our aim was to liberate Albania, not Greece. during training in Bavaria in 1950. The operation continued with Balli Kombëtar men throughout 1950, but in 1951 I refused to help any more. From then on it continued mainly with royalists. Then in December 1953 they tried to reconstruct the committee and include former fascists who had worked with the Italians. We refused to go along with that. But by then we had been on bad terms with the British and Americans for two years already. In 1954 Zog agreed to have ten or twelve men from his Royal Guard parachuted into the Mati area. Zog had no scruples about sacrificing the lives of his close supporters. These men were all captured by the communists because Philby had informed them. Messages were sent on their behalf saying that they were well received by the population. This encouraged the Americans to send even more. The communists then executed not only the Albanians who had been parachuted into the country, but also all those with whom they had made contact, about 400 people in the Mati area. They did this only at the end of the affair, after the Americans finally understood that their men had been captured. Bajraktari was a member of the consultative committee, not the junta. He played no serious role. During the war he asked for £40 million in order to form a big pro-Allied army in the Balkans. He wanted to liberate Albania with gold. The people we chose in 1949 had already taken part in the fight against the fascists and the communists. They already knew how to fight. They were brave, like most Albanians, and experienced in battle. I chose them too for their intelligence, their ability to make contact with the people, to prepare the way for liberation. I wanted men who were capable and well-known in the place where they were to operate, good at forging links and collecting information. These were the 30 who went to Malta. They knew it would be very dangerous, but they were ready to make any sacrifice. Our people had made contact with high-ranking officers in the Albanian army and they were ready to abandon the regime. At that time no one in Albania thought that the regime was going to continue. Only the incomprehensible weakness of the British and Americans prevented it from collapsing. Our sponsors deceived us. They had no intention of intervening seriously. Their most serious failure was in not persuading Tito to accept our plan, in allowing him to set up his own committee under Taref, a Slav and a pro-communist. Taref’s committee was the Yugoslav answer to our committee. The Yugoslavs would only accept the overthrow of Hoxha if it was replaced by a pro-Tito regime. They would not allow Albania to become democratic. So when the British and Americans began sending in their guerillas, the Yugoslavs did the same and so did the Greeks. There was no coordination. The Italians too sent in a team led by Alush Lleshanaku, who was a supporter of Ismail Vërlaci, the son of the man who was Albania’s prime minister under the Italian occupation. They were the richest family in Albania. Vërlaci was succeeded as prime minister by Mustafa Kruja, who was more intelligent. The Lleshanaku group was liquidated. 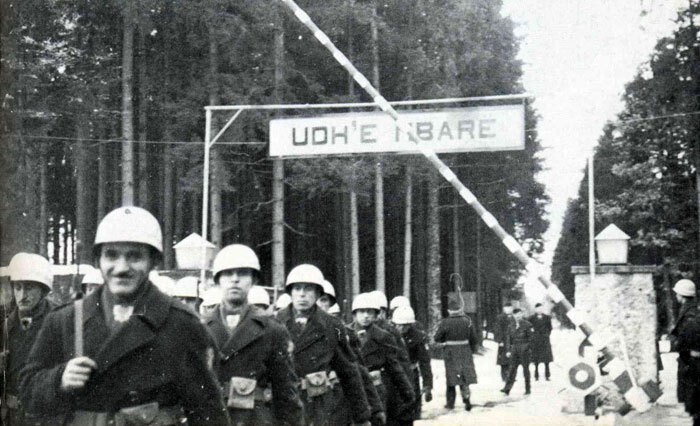 We had hundreds of emigre Albanians who were ready to go into Albania and fight, maybe even thousands. When I went to the camps near Naples to choose the men, there was discontent about why I had chosen only those 30 and not others. Everybody wanted to go. We could have got thousands of Albanians - and others too, Bulgarians, Croatians, a force big enough to free the country. The method chosen by the British and Americans could never have worked. It was no good sending in four or five people to look for local leaders to start a revolution. All such people had already been destroyed by the communists. We should have sent thousands in and created areas of opposition to the regime. We could only recruit the numbers that the sponsors demanded. The British told us they wanted 30 for Malta. The Americans told us they wanted a company of 200 in Germany. So we had no opportunity to put more men into the fight. I didn’t go to Naples myself. I sent someone and gave him the names. And they were under orders not to breathe a word about it to anyone else, not even to their own brothers. All the emigre Albanians were enthusiastic in those days. The British and Americans should have taken what I told them seriously. The men went to Malta in July and August. I didn’t go there myself until September. I had problems with the Italians over my visa. My impression in Malta was that the British instructors were good and that my men were full of enthusiasm. I was there one month and I left after the first group was sent in, after Frashëri’s death. Smiley was very pleasant. The British did not accept certain of my conditions, however. I wanted the guerillas to report to me in the first instance, then to the British. I said that Albanians should give their first loyalty to other Albanians. And they would be more frank with us. Our interests might not always be the same as British interests, let alone Greek or Yugoslav interests. The matter was solved only when a senior British officer, a brigadier, intervened and then I allowed the men to go. The British training was very good, more serious than the American training. And British security was better. This was because Malta was an island and because the Americans put their trust in the Zogists, who were a group without order, discipline or sophistication. Also the British made better arrangements for the delivery of men into Albania. I saw the first embarkation in October 1949 and I was impressed by it. There was never an accident with the delivery by the British of soldiers into Albania. September 1949 was the time of great hope. I began by staying with Colonel Smiley and his family at their home in Malta. Then after a few days I moved to the fort. Jani Dilo was the man who dealt mainly with the trainees. I briefed each group leader. Then I returned to Rome, where I lived in Corso Trieste. I went back to Malta a year later and already had my doubts. I tried not to raise any false hopes with the men. By the middle of 1951 I was sure that it was not going to work. I came to London that summer and met members of the British and American intelligence services. I told them that either we should act seriously and liberate Albania with substantial numbers of men or we should call the operation off in the interest of saving men’s lives. They heard me out and begged me to go to Malta once more. So I went there in September 1951. I would not give my authority for the dispatch of any more groups into the country. I think they did one more group without me, with the help of Ihsan Toptani. Michael Burke was very intelligent and understanding, but after him Joe Leib was a disaster. And the secretary of the executive committee, who was also secretary of the Zogist movement, was an idiot, almost more idiotic than Leib. I went to the training school in Germany once. It was a big house, isolated, with a park. Mangelly was a man of about 30, with a wife and son. His parents had come to America from Albania. And I went to Hohenbrunn once to calm the people down over the incident of Zog’s tomb in the snow. It was a stupidity that was threatening to become a battle between the two parties. Everything that Leib and Gogo decided became known to the communist embassy in Rome. Gogo talked about it in cafes. The communists had agents among the Zogists, in particular a certain Rapo Binieri. It was not only the Albanian embassy, but the Soviet and Yugoslav embassies also. And then there was Philby on the British side. Gogo knew all these details in advance, the dates and places of the landings, and he was gossiping about them to Binieri and others. He was very well paid by Leib and he spent every evening in the Casino delle Rose with his mistress. He dressed in very good taste and went everywhere by taxi. He lived in a very nice apartment in Rome. I hardly saw Leib more than two or three times. I saw at once that he was a useless type. When he wanted to see me, I usually sent Andoni or Zef Pali, and they made an excuse why I couldn’t be there. Ernest Koliqi and Vërlaci were the main pro-fascists who came into the committee, with Xhafer Deva, who was minister of the interior under the Germans and a Gestapo agent, Hasan Dosti was a miserable type. He made intrigues with the Zogists, and the Americans knew that Dosti would do everything that they asked him to do. Dosti was a feeble type who could never make an impression on people who were stronger than him. It wasn’t a question of money with him, although perhaps it was with others. We had nothing against his having been a minister under the fascists, under Mustafa Kruja. This was at a time when the Italians were in favour of colonising Albania with the Arbëresh who were people of Albanian origin who had emigrated to Italy. Dosti found a pretext to become minister of justice in the nominated government in order to oppose this. He sacrificed himself for a good cause. He had Frashëri’s approval for this. Abas Ermenji in later years. 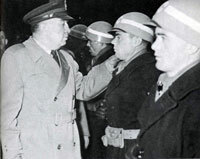 McLean and Amery were in Rome during the summer of 1949, but they did not take part in the discussions that formed the committee. I was contacted by McLean and Amery in Athens in May 1949. I was the only BK leader there at that time. I was living in a flat, but the Greeks were keeping me as a hostage. We talked about Yugoslavia’s expulsion from the Cominform and they suggested to me that Albania had become a country without defence, that it had become a vacuum between Yugoslavia and Greece. We all thought it likely that Greece and Yugoslavia were going to take military action against Albania. However, they said, the American and British authorities were against this. They suggested to me that it was wrong to leave a vacuum there. This was why an Albanian action was necessary, to protect Albania’s interests, to curtail Greek and Yugoslav ambitions. The idea of liberating Albania from the communists went hand in hand with this. Albania was to become a country capable of offering resistance to her two neighbours, of course as a member of the western camp. Amery and McLean told me that I was the only person who could take such an initiative and make it good. They knew my popularity among the Albanian youth. They did not tell me that at the same time the Americans were making contact with Midhat Frashëri in Istanbul and that of course certain other allied personalities had spoken to Zog in Cairo. I accepted in principle, but I told them that I could not take the main role because we were a political party and the party’s president was Frashëri. At that stage there was no mention of the royalists taking part, nor was there with Frashëri in Istanbul The first mention of them was in Rome, at the end of May or beginning of June. I accepted the participation of the royalists not because they meant anything inside Albania, but because of the outside world, which knew Albania only as Zog’s kingdom. We could not convince the outside world that Zog was no longer anything in Albania. The British and Americans took me to Trieste. But later they realised that Frashëri would not enter into any agreement without me. Then they came to Trieste and spoke to me threateningly. If I continued my opposition, they said, they would abandon the fate of Albania and hand it over to the Greeks and Yugoslavs. They took me to Trieste partly because it was an international city and they wanted to protect me from the Italians, who were out to arrest me any day, partly to put me under pressure to agree to what they wanted. They thought it would be easier to manipulate the others if I was away from Rome. But the others would not come to a decision without me. When the British carried on threatening, I said that if necessary I would knock at the door of the first Soviet embassy I could find in order to save Albania. The Soviets are intelligent, I told them, and they know what our party represents. It ended happily though, even in laughter. I telephoned Frashëri in Rome and advised him to agree to the proposal of a junta, of which I was to be a member. Then, after the agreement, I was asked to come and see the Italian governor of Trieste. He received me very well, gave me proper documents with a residence permit, after which I was taken by car to Udine and then by American military aircraft to Rome. This was in early August, about three weeks before the proclamation of the Free Albania Committee in Paris on August 26th. I wanted our sponsors to give us the means to train a small and well-equipped army, also to land them in Albania and supply them by air. This would allow us to establish centres of resistance and then raise the population against the communist government. The people would have sided with us at once and units of the Albanian army would also have joined us. This was our information. At that time no one thought that the Albanian regime was going to survive. It was certainly the most propitious moment to try and overturn it. An Albanian army colonel in Gjirokastra told one of our agents that he and many others were prepared to move, provided that we sent a substantial force and parachuted in the necessary equipment. So there were some positive indications as a result of the first landings from Malta. All this information came from the British-trained groups. We got virtually nothing from the American-trained groups, who were almost all wiped out. We also found out that there was a Soviet submarine base at Ishëm, north of Durrës, as well as the main base on Sazan island. These results were not discouraging, but what was discouraging was the attitude of the British and Americans, their lack of will to undertake an operation in the grand style. It was a pot that could not be brought to the boil on a small flame. It was not possible in Albanian conditions to assemble groups of people and create five-man or six-man cells. The controls were too tight. Also the British and Americans hesitated too long. This allowed other countries, especially Yugoslavia and Greece, to prepare and send in their own agents. And all this confused the Albanian people. They could understand and accept an operation mounted by Albanians under British or American sponsorship, but who were these agents of Greece and Yugoslavia, the two countries that wanted to destroy us? So after these first attempts we told our sponsors that liberation was a practical possibility, but only with serious forces. The Americans used less sophisticated means than the British. And they had to deal with the royalists. And there were leaks on the royalist side. And there was a strong police force inside the country and a terrorised population. This is why it all failed. The main carnage was in 1954. After the trial of Zenel Shehu and Matjani, the communists killed about 400 people in the Mati region. First of all, the families of those condemned in the trial were shot. Then there were the people whom Zenel and the others were supposed to contact. Zenel gave the communists all their names under torture. Then when these people were arrested, they implicated other people, also under torture, often people who were in no way involved. They would do anything to stop the torture. Such bloodshed would never have occurred if our party had been involved, but 400 Albanians more or less was something that Zog didn’t care about.